The morning sunshine hits Cynthia Sanchez like orange stripes. She races onto the field with the same zest and joy she has had since she was a freshman. Her detailed approach in practice is a reason why CSUN values her leadership for a journey that started with many obstacles. Now with 10 games left in her college career, Sanchez has 19 career goals and needs only four more to cement her name in history as the Matadors all-time scoring leader. Prior to coming to CSUN, opportunities didn’t come easy for Sanchez. She was born and raised in the town of Gilroy, Calif. located 80 miles southeast of San Francisco. It is a city that has a population of under 50,000 and is known for its garlic festival that draws thousands of tourists from around the world. But other than the occasional pungent stench, sometimes an athlete of Sanchez’s caliber can go unnoticed. Sanchez was dealt a major blow in her senior season of high school when she discovered she tore her ACL. The few schools that did have interest in her had doubts about whether playing college soccer was a possibility for her. The school that remained fully committed was CSUN. Coach Keith West, who has a reputation for taking previously injured players and bringing them back to prominence, saw an investment in Sanchez. In spite of the lack of experience compounded with a severe injury to rehab from, Sanchez’s spirit was tested, but never broken. After getting a medical redshirt, Sanchez started in 14 of 20 matches while adding a respectable three goals and an assist. 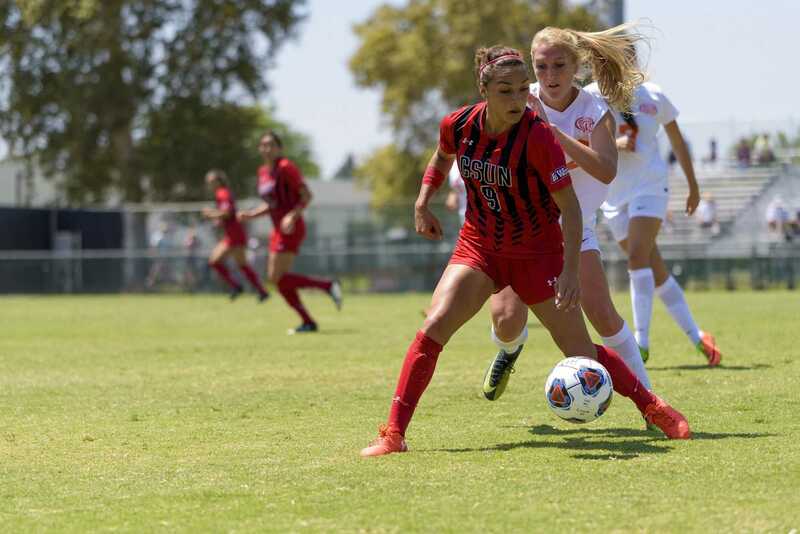 Sanchez’s season set the all-time Matadors record for goals in a season with 11 and earned First Team Big West honors. Now in her senior season, Sanchez feels she can elevate her game to an even higher level. The only person who remains in her way of history is Farryn Towny who last played for CSUN in 2010. Towny in many ways walked the same path that Sanchez did. She wasn’t highly recruited out of high school and like Sanchez suffered a major injury during her career. Towny’s injury was a stress fracture in her shin that forced her to sit out her sophomore season after playing in only four games. Her career took off soon after and she finished with 22 goals, half of which were game winners. Sanchez will now try to perform with a same level of consistency and attempt to chase down a record that has stood for the past seven years. Towny admits that having the record has always been an honor but hopes that Sanchez will climb to the top of the board. As fate would have it, Sanchez wears no. 9, and so does Towny. It’s been a long road for Sanchez, not just for the miles accumulated in her career, but in her development as a player and a person. “For me breaking that record would make all the struggle I went through worth it,” Sanchez said. Cynthia Sanchez has 10 games left to make history.